Children respond to consistency and learn well through repetition. This is why regular safety drills are strongly encouraged, if not required, for all schools & childcare centres. Emergency Preparedness Week is just around the corner on May 6 – 12, 2018 which makes it a perfect time to polish up the emergency response procedures to ensure that these precious little humans react like well-oiled machines to the plans you have in place. If you are a parent and are not aware of your child’s school or care facility’s emergency response plans, now is the time to open that dialogue. Drop – In place, onto your hands and knees. This will prevent falling over due to shaking. Moving around increases your chance of being injured. Cover – With one hand, cover your neck and head and crawl under a desk or table. If that isn’t possible, proceed to an interior wall that is away from a window, shelf, or area where items are stored overhead. Hold On – With the other hand, hold onto your shelter, stay as calm as possible and remain in that place until the shaking stops. If you are the care provider of an infant, calmly and carefully pick up the infant and bring them to a Drop, Cover and Hold On postion and surround or cover them with your body to protect them. Eliminate Hazards before they become hazards! 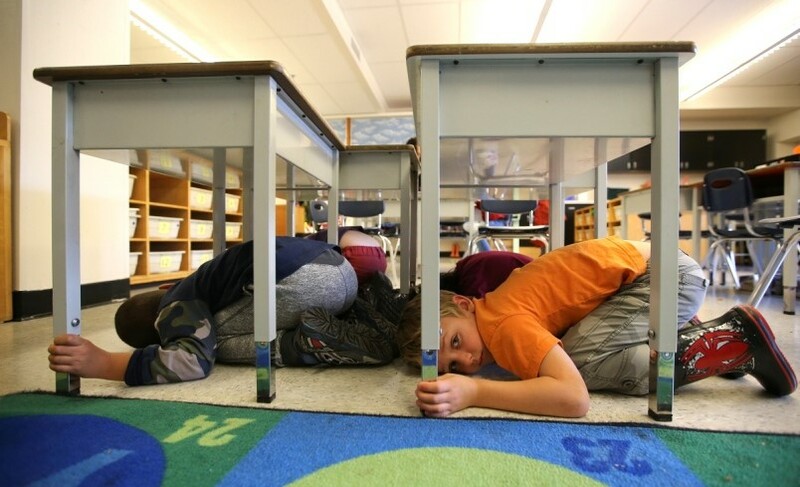 Teachers and Childcare providers can do a lot to ensure safety during earthquake situations before they even happen. Remove anything from overhead shelving – the top of built-in or free-standing shelves should not be used for storage. Secure free standing shelves and cabinets to the wall – brackets and screws are an inexpensive way to do this. Consider installing latches or childproof security systems to storage doors on all cabinet doors. This will prevent items from falling out during shaking but still allow for easy access during daily use. Instill ‘clean & clear = safety’ practices. We all know that the cubby area in a classroom can be a chaos that is not easily avoided. However it is usually at an entry point of the classroom and therefore should be as clean and clear as possible. Try a weekly reward for students with the cleanest cubby and discuss how important it is that doors and hallways are always clear. The well-being of children in all life’s situations has everything to do with that child’s ‘village’. The adults that mould children into they are have a strong role in ensuring their safety and happiness everyday. As someone that is part of that village, take steps to build the rational plan to protect them. Get supplies ready. Each classroom should have a ‘grab & go’ emergency kit and the school should ideally have a central kiosk stocked with enough supplies for each staff member and student as well. The classroom kit is important should the students be unable to leave the classroom or should the kiosk be compromised or damaged. Daycare or other childminding organizations should also have a ‘grab & go’ emergency kit with enough supplies to sustain all individuals for several hours until the child is picked up. GetMyKit has a free Fundraising Program where schools and childcare centres can raise money for free emergency kits or for initiatives & programs of their choosing. Have monthly staff meetings about emergency response. Discuss roles and responsibilities for each staff member and consider involving your School District to discuss your communication plans with them. Make sure that you have a command centre with at least 3 – 5 certified first aid administrators. It is of the utmost importance that the adults are calm and informed during an emergency situation. Kids will feel enough stress and fear at that time – they should not feel additional stress from the adults they look to for guidance. Ensure each child has a “comfort kit”. Items can include: health information, a photo of the family, a short letter to the student, a small stuffy or toy, allergen-free granola bar(s) or snack, light stick, water, guardian contact information. Practice emergency pick-up with the parents. Have a meeting first to discuss what will happen, what your procedures are and pick a date each month or so to practice emergency calls and pick-ups. Make monthly drills a standard at your school. There is no such thing as over-practicing! Repetition is key! After the drill, debrief with your class and chat about how the drill went. Ask how they felt. What went well? What could’ve been better? Talk about their fears of these emergencies and let them know that by building a plan and practicing response, it will help them be safe. Facility staff need also need to have strict plans in place for students or children with special needs and disabilities. Thoroughly discuss their child’s needs with their parents, work out a plan, designate a staff member to those children. In short; have a plan in place and practice it, gather supplies and be prepared to use them, involve parents, neighbors and the community in your emergency response program, and communicate regularly with everyone involved. 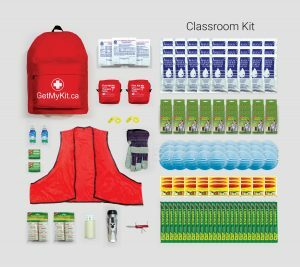 GetMyKit can help your school with supplies, planning and through Emergency Preparedness Events for your community where we talk about why it’s important to be emergency prepared, how to make an emergency plan and what to include in your supplies. Book an event at your school today by contacting [email protected] or call 1-888-673-1222.